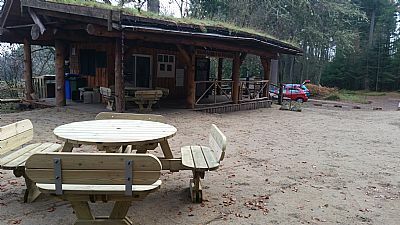 Thanks to funding from Paths for all, we have landscaped the cabin area and added accessible seating to make using the area easier for those who are less able. 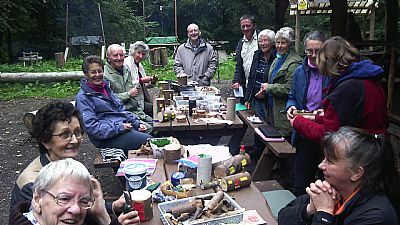 We welcome people of all ages and abilities to the wood. The cabin is fully accessible by wheelchair and available to those who wish to warm up by the wood-buring stove. (NB Access is at the far end of the decking platform). The area in front of the cabin has been landscaped (Nov. 2018) to make it even underfoot. Round tables are now in place which are more user friendly than the picnic tables. The toilet, which is 20 metres from the cabin is fully accessible and the path is good. (Normally this is only open during organised sessions but the key may be provided on request to other groups and individuals). The play area opposite the cabin is designed for people with various levels of mobility. 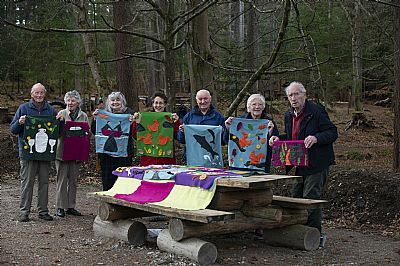 We run a Dementia Friendly Get Outdoors project on Fridays from 10.30am to 2pm - this will resume in the spring of 2019. 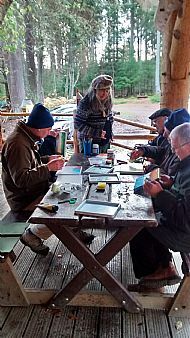 This is designed for people living with dementia and their carers. .
Activities may include some exploration of the wood, artwork, woodwork, other craft activities and cooking. Each session ends with a shared meal. For further information please contact Simon on 07947772066. The programme (2018-19) is financially supported by Life Changes Trust with other support by Alzheimer Scotland. Previous support has been provided by Forestry Commission Scotland and DEEP and Tesco Bags for Life. Many thanks to them (and to all who voted for us! ).